Dr. Slick Arrow Scissors, Microtip 3.5"
These scissors have exceptionally fine points for performing very delicate tasks. This is a good choice as a general working scissor when you are tying very small flies. Made entirely from stainless steel. Precision ground cutting edges. 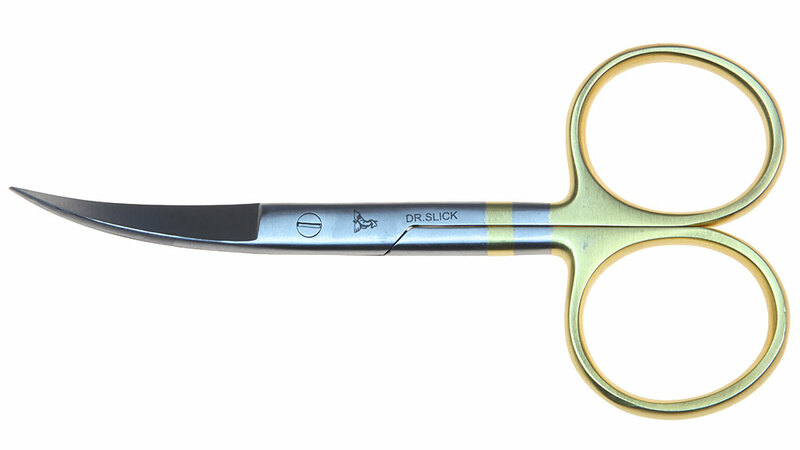 Dr. Slick All Purpose Scissors, Straight 4"
Dr. Slick All Purpose Scissors, Carbide Blade 4"
These scissors have tungsten carbide blades welded onto the scissor blade frame. T.C. is 7x harder than stainless steel and holds an edge longer. These can handle all types of tying materials, but were created to tackle modern synthetic materials. Dr. Slick All Purpose Scissors, Curved 4"
Dr. Slick All Purpose Scissors, Microtip 4"
Dr. Slick Arrow Scissors, Carbide Blade 3.5"
Dr. Slick Arrow Scissors, Straight 3.5"
The arrow blade is designed to give the tyer the latitude for cutting a wide range of material types. These 3 1/2" scissors have exceptionally fine points for performing delicate tasks while providing a notch at the base of the blade for cutting soft wire and slippery materials such as plastic tubing or monofilament. This is a good choice as an all around working scissor. 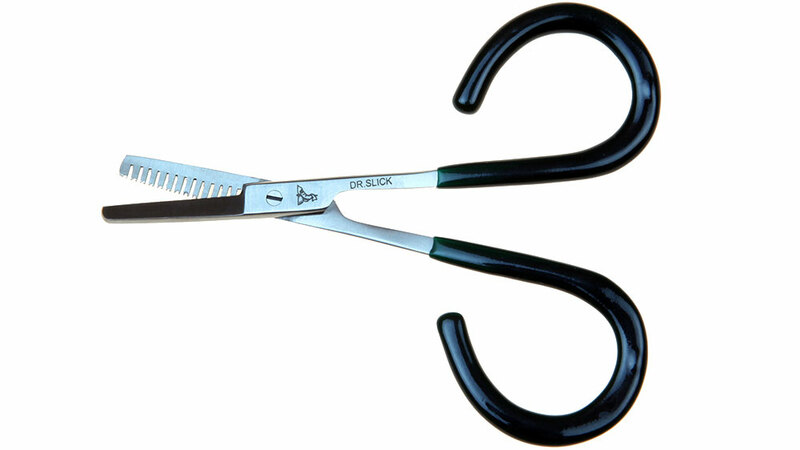 Dr. Slick Braid Scissors, 4"
These affordable scissors are specifically made for cutting braided line cleanly. Even Gel Spun lines like TUF LINE XP are easily and cleanly severed with these scissors. Dr. Slick Hair Scissors, Carbide Blade 4.5"
Dr. Slick Hair Scissors, Curved 4.5"
Long heavy blades are designed for large flies and tough materials. If you work with hair or other heavy materials, this is a true workhorse. Excellent for natural materials and can handle most synthetic. Great scissor for in-hand tyers. Curved blades are handy for changing your line of sight, or trimming material into curved shape. Dr. Slick Hair Scissors, Straight 4.5"
Dr. Slick Iris Scissors, Straight 3.5"
The classic! Most of us started with Iris scissors and they have stood the test of time. Thin blades and hypodermic tips make these ideal for small flies and detail work. Excellent with natural materials and can handle most synthetics. 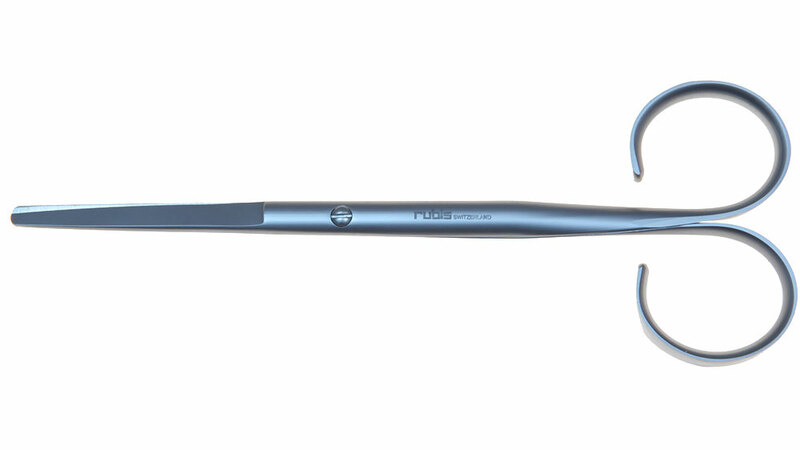 Dr. Slick Razor Scissor, Straight 4"
Possibly the sharpest scissors ever created; think razor blades with handles. These thin blades with a razor edge make short work of all materials. Adjustable tension allows for loosening or tightening as materials warrant. Cuts through natural and synthetic materials like butter. Made from 440 grade steel. These are the ultimate tying scissors. For the tyer who wants one all-purpose scissor, this model offers an extra fine point for precise trimming. In addition, the comfortable, closed plastic finger loops make for precise control during use. The edge on one blade is serrated for a sure cutting grip. Imported. Large & straight scissors. These have a simple yet functional design. Stainless scissors made in Switzerland. 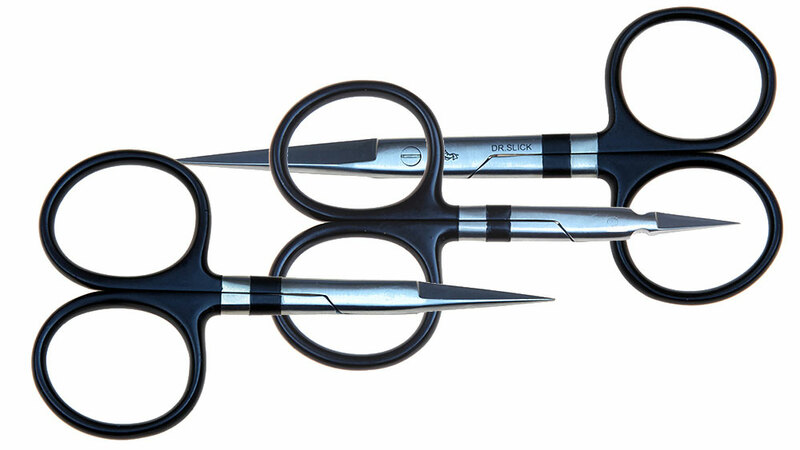 Precision made from Swiss stainless steel, these razor sharp scissors are great for cutting sheet material or trimming materials held in a Magic Tool. Precision made from Swiss stainless steel, these razor sharp scissors help with fine detailed work. This is a great scissor for doing generalized fly tying. This picture was taken at the Metropolitan Museum in New York City in 2006 by Yannick Trottier. The exhibit was labelled as follows: 39.2.2 Perhaps 2nd century A.D. Said to be from Trabzon, northeastern Turkey (ancient Trebizond) Bronze inlaid with silver and black copper(?) Rogers Fund 1939 (39.2.2) This piece is remarkable for its rich inlays. Both sides of each blade are decorated with three registers of figures. Whoever created the design clearly had a sense of humour; when the shears are closed, the top register brings a dog face-to-face with a cat on one side and a lion with a lion on the other. The combination of vague iconography, attenuated drawing, and dour expressions marks the shears as an "Egyptianizing" rather than an actual Egyptian style. Perhaps they served a ritual function at an Isis sanctuary at ancient Trebizond on the Black Sea. According to Wikipedia: The earliest known scissors appeared in Mesopotamia 3,000 to 4,000 years ago. 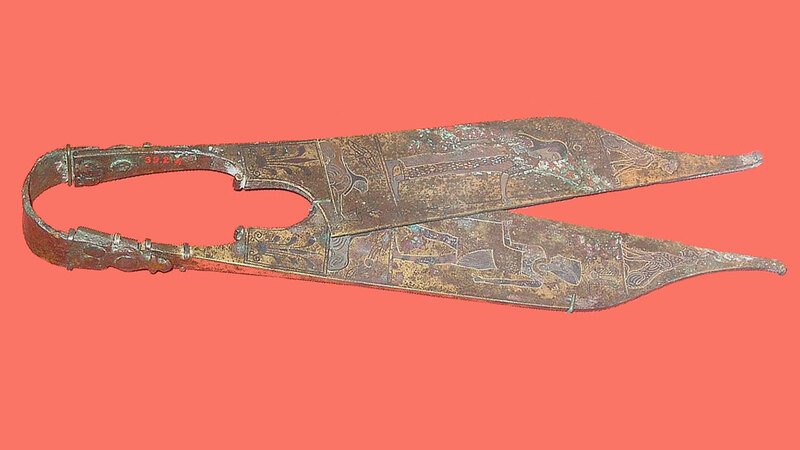 These were of the 'spring scissor' type comprising two bronze blades connected at the handles by a thin, flexible strip of curved bronze which served to hold the blades in alignment, to allow them to be squeezed together, and to pull them apart when released. A high quality pair of scissors may be the most essential tool for tying high quality fishing flies. You can hold both the hook and thread in your bare hands and tie a fly without a vise or bobbin (we are not suggesting that you do so), but it would be nearly impossible to tie a fly without a pair of scissors. Normally, each fly tier will have several pairs of scissors. Each will have a specific use, such as the pair that does most of the trimming and shaping in most fly tying operations, and also pairs that are used for specific purposes, such as cutting thicker than normal or harder than normal materials. There might also be a pair for doing finer than normal work, or a pair with curved blades for making curved cuts. 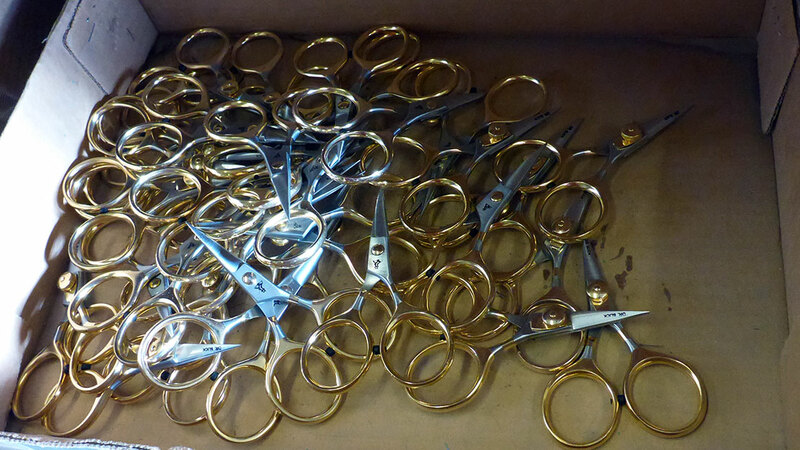 A tray of Razor Scissors after being fine tuned, polished and logoed at the Dr. Slick factory in Bozeman, MT, USA. The initial production of these scissors was done in Pakistan, then shipped to Bozeman, where each pair was tested, adjusted,and fine tuned by hand, then readied for shipment. Dr. Slick does thousands of pairs of fly tying scissors per year. These stainless steel scissors have tungsten carbide inserts in the blades for sharp, long lasting cutting edges. Tungsten carbide is nearly as hard as diamonds. The Dr. Slick razor scissors have an adjustable pivot screw that can be tightened as the blades wear. These scissors have curved serrated blades for making curved cuts for sculpting hair, sheet foam and other materials. These long bladed scissors are made in Switzerland, and are designed for cutting lengths of materials to be spun in dubbing loops. 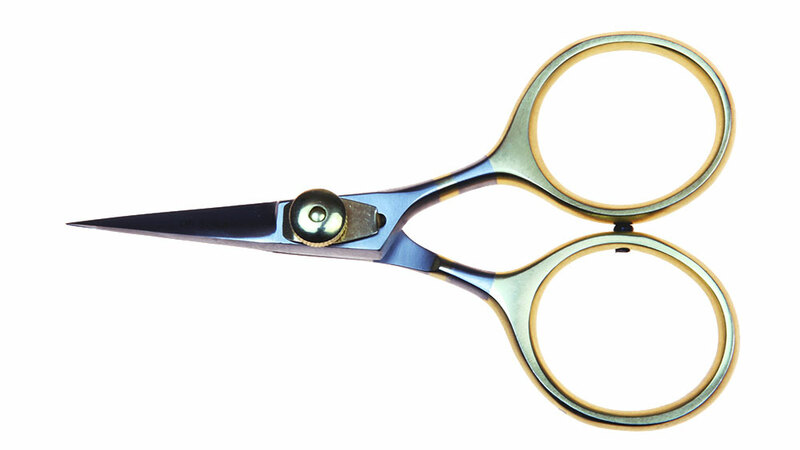 The scissors are made for thinning hair and/or stranded materials so that they will move more freely in the water.